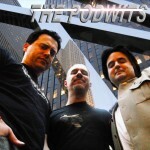 Well they’re back at it again for an all new Podwits Podcast. While enjoying a nice cool beverage in a safety-cup at their local convalescence home, the boys wax about the oldest American Civil War widow to die in 2008, and Brian’s 2010 trip to Père Lachaise Cemetery in Paris, which lead the boys over to: The Doors and Jim Morrison‘s untimely demise; Oliver Stone; the Fillmore East and West venues overseen by promoter Bill Graham; and the greatness that was Duane Allman. They wrap up on a very serious note (harking back to their Shattered Hulls series), explaining the emerging details on actually what really sank the Korean ferry, the Sewol. They’re all over the map (quite literally) in this week’s installment, so come and download it today! The Bohemian Grove Club in Calfornia was the supposed cult that celebrities and presidents alike were said to be members of. Here is the Dean Benedetti Box Set that compiled the recording he did of Charlie Parker‘s solos in 1947. Have a gander at the Concert Vault section of Wolfgang’s Vault for some amazing super-rare performances. Read the supposed self-written adventures of Jim Morrison after he successfully faked his own death, alive and well and living in all places, Louisiana. The Four-Color Fanboys’ Second “Issue” Is Out!